The world's most powerful laser has heated matter to a truly sweltering 10 million Celsius. The Vulcan laser concentrated power equivalent to 100 times the world's electricity production into a spot just a few millionths of a metre across. Writing in the New Journal of Physics, scientists said they could create the conditions for fractions of a second. The experiments demonstrated concepts which could be key to building a future nuclear fusion reactor. The UK has proposed an even more powerful laser facility, known as Hiper (High Power laser Energy Research), which will study the feasibility of laser fusion as a potential future energy source. "Hiper is a proposed, very large-scale facility and so we have to check that our understanding is correct," explained Professor Peter Norreys of the Rutherford Appleton Laboratory (RAL) in Oxfordshire where the experiments took place. Nuclear fusion is looked on as a panacea in a world that demands ever increasing amounts of energy. The fuel for the process is deuterium and tritium, two heavier forms of hydrogen. Deuterium is commonly found in seawater, whilst tritium can be made from lithium in a so-called "breeder" reactor. 1. Powerful lasers irradiate a fuel capsule causing the outer layer to rapidly expand. 2. The fuel capsule's core increases in density, converging at the tip of a gold cone. 3. An intense ignition laser is fired into the gold cone producing energetic electrons. 4. Electrons bombard the fuel raising its temperature to 100 million Celsius, initiating fusion. When these isotopes are combined at high temperatures, a small amount of mass is lost and a colossal amount of energy is released. The process naturally occurs in the core of the Sun where huge gravitational pressure allows this to happen at temperatures of around 10 million Celsius. At the much lower pressures on Earth, temperatures to produce fusion would need to be much higher - above 100 million Celsius. 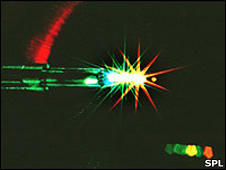 Ultra powerful lasers, such as Hiper, have been proposed as one method for reaching these extreme conditions, although many remain sceptical about the technique. The project has been drawn up to capitalise on another project at the National Ignition Facility (NIF) at the Lawrence Livermore National Laboratory in California. 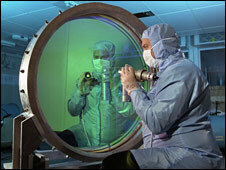 NIF is expected to demonstrate energy production from laser driven fusion between 2010 and 2012. If proven, the technology could rival the current favoured technique for initiating fusion which uses superconducting magnets to contain and fuse the hydrogen nuclei. This technique will be used in the 10bn-euro Iter reactor currently being built in Cadarache, southern France. The new work laid some of the foundations for Hiper. In the experiments, the Vulcan laser focused one petawatt (1,000 trillion watts) of power into a spot about one tenth of the width of a human hair. The pulse lasted for one picosecond (one trillionth of a second), heating the target to 10 million Celsius, one tenth of that required for nuclear fusion. However, even at these relatively balmy temperatures, the conditions were equivalent to these found in supernova explosions. A special high-speed camera probed the fleeting moment. "We wanted to understand the basic interaction of matter with these laser pulses," Professor Norreys told BBC News. Specifically, the team wanted to understand how much energy was transferred from the laser to the target. "Efficient coupling of the laser energy to the target is crucial for fast ignition fusion, and is one of the main questions on which the design of¿ Hiper depends," said Dr Jonathan Davies from Instituto Superior Technico, Lisbon, Portugal, who also took part in the study.